In an earlier post about the national curriculum review I was thinking positively, if we have learned anything from previous changes, the profession could cope with the draft National Curriculum proposals. There has been a certain amount of heat generated since my post and I added some further references. Here, I will step away from the pressures on English, maths and history. And continue to duck the thorny issues of qualifications and assessment. Thi post is a response to the non-governmental and academic clamour for the inclusion of climate change and sustainability in the NC specification. It concerns me when demands a made ‘for this and that’ without regard to the wider curriculum landscape – or the long queue of other competing claims. I have to declare an interest in being chair of the Geographical Association’s Sustainability and Citizenship Special Interest Group and a SE-Ed Associate. You might think I would be a prime supporter of these petitions. It’s not that I am against petitions per se but we know the secretary of state hasn’t listened to any but his own prejudices yet – and he is not about to start now. Kenneth Baker, MP, education minister, about 1987. Andrew Jones, MP, responds to criticism of the new NC history proposals, 2013. Putting the school curriculum back in the ‘secret garden’ would be an absurd proposition. However, I believe the micro-managing of the national curriculum, by politicians and their QUANGOs, has become part of the unreasonable burdens of leadership and teaching in schools. We do not need our own professional colleagues building up those pressures in their place. I don’t seek to exclude NGOs, or wider interests, from the process of national curriculum review. It’s the current government policy that has done that. Nor do I think it sufficient to reduce the NC to core knowledge. Meanwhile, to read that ‘the government has banned climate change from the curriculum’ is a sure sign that someone is headline seeking and has not paid attention to the process of reform. Shouting late and loud doesn’t help. But shouting untruths is counter-productive. Part of the issue is a lack of engagement with how the curriculum is managed in schools. Using terms such as curriculum aims, objectives and core knowledge proficiently would help the case rather than detract from it. Many protagonists think it appropriate to merely tell others what they should do in terms of content. Here’s an example of mis-understanding of the changed balance between the school curriculum and the NC reform from a mutli-signatory open letter to Michael Gove published in The Sunday Times (14 April 2013) “under the Government’s new draft national curriculum for England, education on the environment would start three years later than at present and all existing references to care and protection would be removed”. (Source.) Also: The Guardian 14 April 2013 article about the letter. 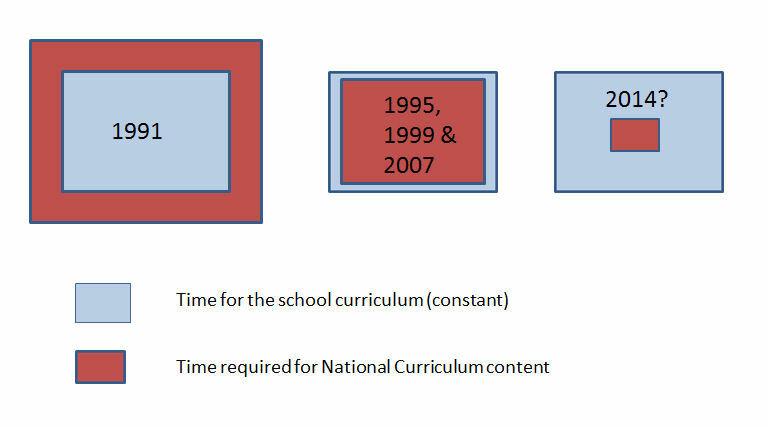 The diagram tries to show how we have gradually reclaimed flexibility in the time in which the national curriculum occupies (or over-occupies) the school curriculum. Such is the assumption that the current compliance culture is effective, some people have expressed concern that schools lack experience in curriculum making. I don’t think so. Or we can build upon where it exists with CPD. In the government’s attempt to restrict the NC to core knowledge there is little ‘debating’ of anything mentioned. Climate change has not been singled out for a ‘cut’. I think we will still be discussing issues in the classroom. This article is quite detailed in quoting from current and draft. I hope you read that to the end – but no further. (I have learned to not waste time on comments below online articles.) Sensible, eh? I don’t mean this facetiously (or claiming originality) but climate is there in the draft and so is change: “understand how some of these aspects have changed over time”. 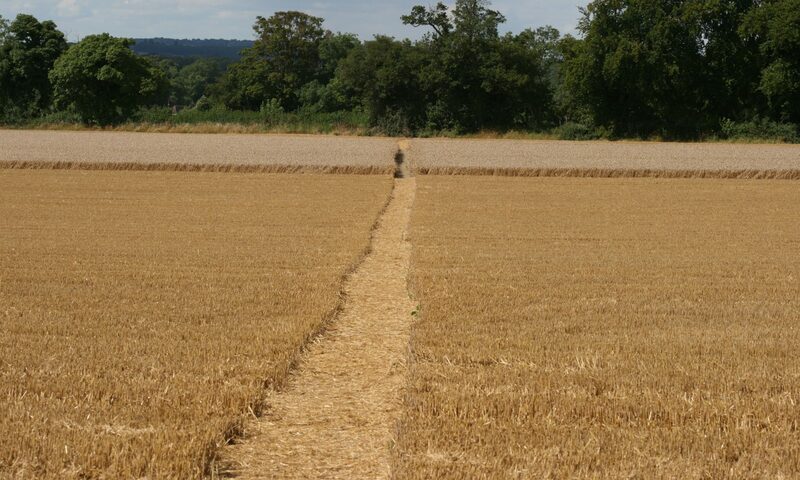 The blogpost title is a quote from the draft geography ‘purpose of study’. (Source pdf: on GA website) So, if it is alright with the rest of you, I think we will see continued outstanding and good teaching and learning about sustainability and climate change. The NC review is deeply flawed. However, we should not regard it as replacing all that has gone before. Clearly, it is only part of a curriculum. Where it is lacking, we can be more explicit in the individual curriculum of each school. and the debate continues with Ed Davey, the energy minister, joining in as reported here. You might have noticed I am interested in the process of curriculum review and the outcomes. I think it important to have strong subject associations and we are fortunate to have the Geographical Association. Looking across to what has happened with computing science / ICT is instructive. See this post by Daniel Stucke and one expressing concern about the reltionship between government and professionals at MirandaNet.